Overall I’m still feeling pretty good and have a decent amount of energy! And it’s a good thing, too, because this month has been jam packed with doctor’s appointments,baby classes, baby showers, photoshoots, house projects, and family visits! It was all great fun (well, all of it except for painting the entire house! ), but I think I might have overcommitted us a bit and am definitely looking forward to a slightly more relaxing/less scheduled Month 8! I can’t believe we’ll meet our little girl in only about 6 more weeks! Okay, so I fell off the workout wagon a bit this month…it happens to the best of us! My main form of working out this month has been painting our entire house (with the help of my hubby of course). Don’t worry, we used non-toxic paint and I wore a respirator mask the whole time! But, unfortunately, getting my walks and Pilates in became less of a priority with the house projects and our busy schedule. I did sneak on the Reformer as much as possible to get a quick stretch or a few exercises in which has helped by body continue to feel good this month. I’ve also started doing pelvic floor physical therapy at Vitalize Physical Therapy. I was diagnosed with Pelvic Floor Dysfunction in my early 20’s (a common but little talked about condition affecting many women of all ages). Because of this condition, I have decided to be proactive about preparing my body for birth by working with a pelvic floor PT. 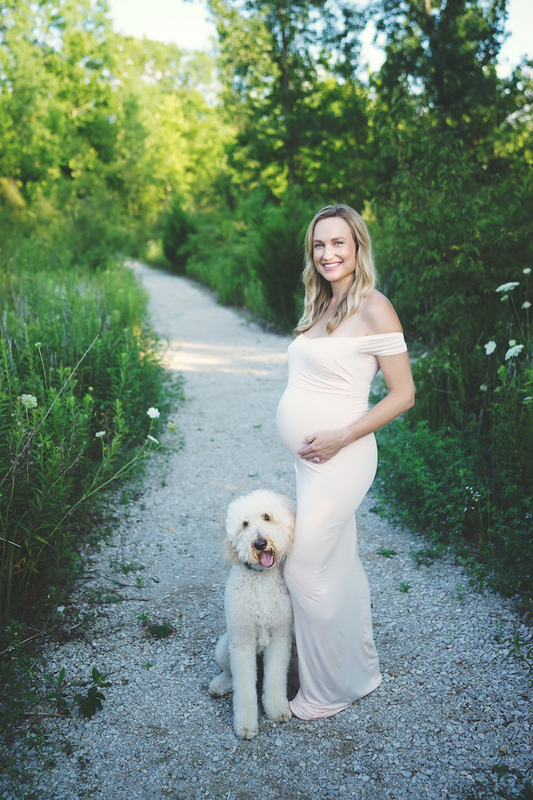 So far, I can feel a huge difference and will continue working with my physical therapist post baby to help my body heal from the trauma of pregnancy and giving birth! This too has become less regimented with my busy schedule this month, but I am trying to get as many on the go nutrients as possible by eating lots of raw fruits and nuts and thank goodness for Juice Bar Carmel for my daily green juice or green smoothie! Dinner usually consists of a meat (organic beef, chicken, or salmon), a veggie, and rice or sweet potatoes. I have also started eating smaller meals more often, as there is less and less room with my expanding belly! Not to mention, any sort of overeating causes major heartburn, so it’s best to avoid this when possible – just not worth it!! Well, considering I’m well into my 3rd trimester, everything feels pretty darn good. I definitely feel pregnant, but I don’t feel super limited by aches or pains and have been able to keep up my active lifestyle. I’m still teaching my full Pilates schedule and am still able to demonstrate many exercises (even advanced ones) that aren’t contraindicated for pregnancy! My hips are still a bit achy when I sleep at night; although, my physical therapist has given me a few glute and abductor (outer thigh) exercises to do that really help stabilize my pelvis and reduce the achiness at night. I’ve also found a few Pilates exercise that are great for this! Beyond that, I have a little bit of low back pain if I overdo it with too much work around the house; however, a few stretches and release work on the foam roller along with a good night’s sleep usually have me feeling 100% better by the morning. I’m actually pleasantly surprised by my lack of back pain during this pregnancy considering I have degenerated disks in my L5 and L4 – I totally credit Pilates for keeping me (mostly) pain free!